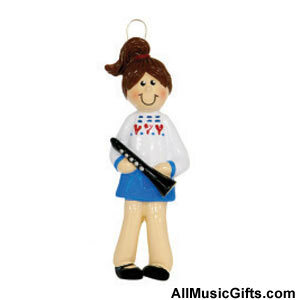 Girl with Clarinet Ornament – Add some extra Christmas spirit to your tree with a cute, Girl with Clarinet Ornament! Wonderfully decorated with colorful paint, this Christmas tree decoration is sure to complete any woodwind player’s holiday. The ornament depicts a smiling girl wearing a white shirt with red hearts holding her clarinet. This music ornament is perfect for the X-mas holiday season. Made from resin. Approx. 3.25″ L.
We also have Boy with Clarinet Ornament. Unique Clarinet Christmas Ornaments at DRUM BUM!